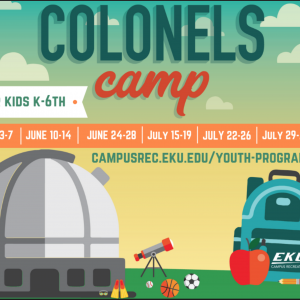 Colonels Camp is a summer opportunity for members of the Richmond and Madison County Community to get out of the house and socialize for a week FULL of activities at EKU Campus Recreation. Colonels Camp is a day camp for children who are going into Kindergarten (turn 5 by August 1st, 2019) to children who have just completed 6th grade. Camp will be held Monday through Friday, 8:00am-4:45pm, with drop-off starting at 7:30 am. During this time, campers will get to experience EKU Campus Recreation and its many activities. Activities include but are not limited to indoor and outdoor games/sports, rock climbing, arts and crafts, group fitness classes, educational sessions, a field trip to Hummel Planetarium, Alumni Pool, KidsPlace, and lots of fun!! 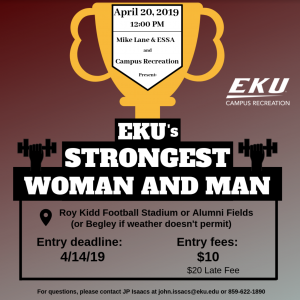 EKU Campus Recreation has an amazing new event for you! 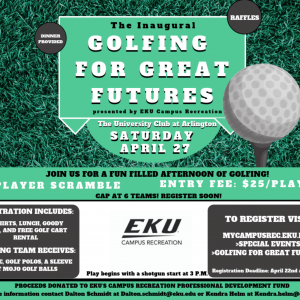 The inaugural Golfing for Great Futures which will be Saturday, April 27th. Check-in begins at 2pm and play begins with a shotgun start at 3pm. It is a 4-Player golf scramble with a max of 6 teams the entry fee is $25 per player. Registration includes: t-shirts, goody bags, dinner, and free golf cart rentals for the day. There will also be raffles going on throughout the day. The winning team will receive a plaque, golf polos, and a sleeve of Mojo golf balls. Registration deadline is April 22nd at 11:59pm. 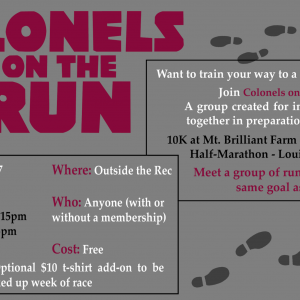 Proceeds of the event will go towards EKU Campus Recreation's professional development funds for student employees. One of our last workshops of the semester is just around the corner! 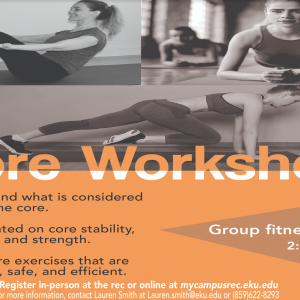 EKU Campus Recreation will be having a Core Workshop on April 28th from 2pm-4:15pm in the group fitness studio. It is $20, or the LLC Group Fitness Incentive winner gets free access to the workshop. You will learn core stability, function, and strength. Understand what is considered part of the core, and the excercises that are effective, safe, and efficient for a killer core workout. Register for this workshop online at mycampusrec or in-person at the Fitness and Wellness Center! You won't want to miss out on this amazing workshop opportunity! The price of the trip includes transportation, food, and any equipment necessary for each specific trip. 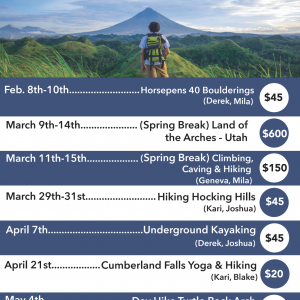 Register today for any trip at mycampusrec!